On the 10th of November, 2017, the Four Points By Sheraton Hotel, Victoria Island – Lagos will welcome a large ensemble of Human Resource and Technology Professionals from across the West African sub-continent, to the 2017 HR Technology Conference. Olawale Adediran – Vice President, CIPM Nigeria and Group HR Director, FMN Plc. Rosy Baker - ISV Manager Africa, Oracle Corporation South Africa and others. 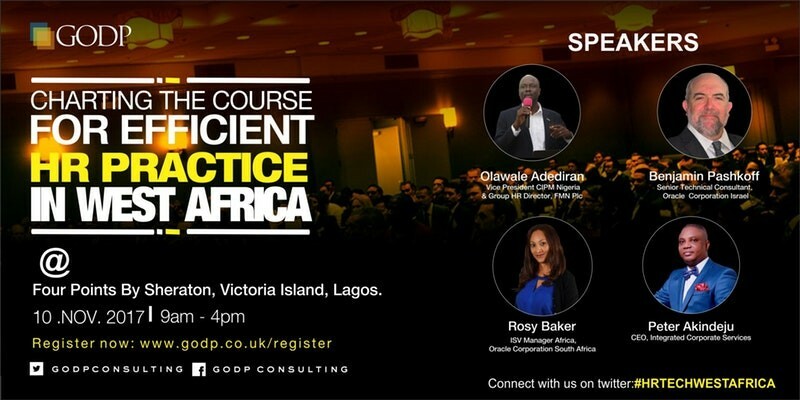 With Topics such as “Africa; The New Technology Hub”, “Achieving Efficiency in The Workplace”, “Human Resource Management and Cloud Technology” and “Efficient Practice in Workforce Planning and Recruitment” among others, the conference will see a unique meeting of HR Consultants, Human Capital Managers, HR Business Partners, Outsourcing and Recruitment Specialists, IT Managers, Chief Technology Officers, Application Developers, Performance Coaches and Culture Managers. 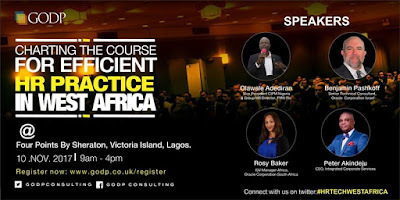 Attendees will be treated to a combination of interactive speaking sessions, exhibitions, demonstrations and other enlightening activities geared at highlighting the effective steps and strategies they can implement in running their group, department or entire businesses, to enhance the efficiency of both their people and processes. Beyond the rudiments, the conference provides an avenue for participants to network with fellow HR and Tech professionals, exhibit new products and initiatives, and expand their horizons beyond their current spheres. By the end of the event, attendees would have greater insight through practical tips on how to leverage technology to ensure efficiency of their staff, HR processes and organisations at large. This event is free, but spaces are limited! Visit www.godp.co.uk/register and complete the conference registration form as an attendee or exhibitor, after which a confirmation mail would be sent to you/your delegates. We look forward to having you at the conference.